Once you have selected your filter model and type, you can select the settings you wish to apply to the signal. The filter settings you can apply will depend on the filter type you have chosen. The Upper and Lower frequency limits are self explanatory. The filter order is how sharp the transition is. A low-pass filter is a filter that passes low frequency signals but attenuates (reduces the amplitude of) signals with frequencies higher than the cutoff frequency. The actual amount of attenuation for each frequency varies from filter to filter. It is sometimes called a high-cut filter, or treble cut filter when used in audio applications. The concept of a low-pass filter exists in many different forms, including electronic circuits (like a hiss filter used in audio), digital algorithms for smoothing sets of data, acoustic barriers, blurring of images, and so on. Low-pass filters play the same role in signal processing that moving averages do in some other fields, such as finance; both tools provide a smoother form of a signal which removes the short-term oscillations, leaving only the long-term trend. A high-pass filter is a filter that passes high frequencies well, but attenuates (or reduces) frequencies lower than the cutoff frequency. The actual amount of attenuation for each frequency varies from filter to filter. It is sometimes called a low-cut filter; the terms bass-cut filter or rumble filter are also used in audio applications. A high-pass filter is the opposite of a low-pass filter, and a bandpass filter is a combination of a high-pass and a low-pass. It is useful as a filter to block any unwanted low frequency components of a complex signal while passing the higher frequencies. Of course, the meanings of 'low' and 'high' frequencies are relative to the cutoff frequency chosen by the filter designer. The frequency response of the Butterworth filter is maximally flat (has no ripples) in the passband, and rolls off towards zero in the stopband. When viewed on a logarithmic Bode plot, the response slopes off linearly towards negative infinity. 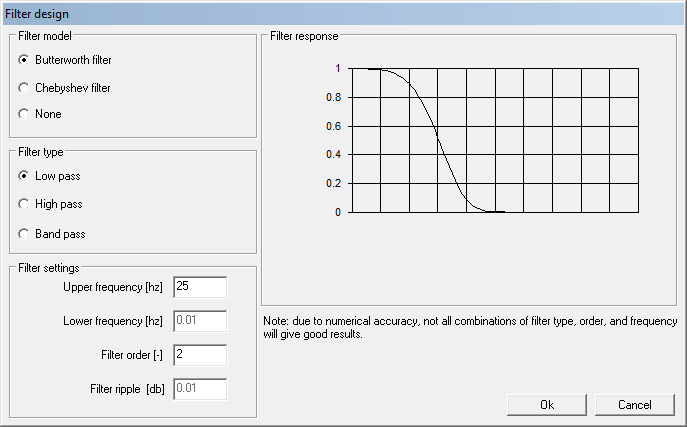 For a first-order filter, the response rolls off at -6 dB per octave (-20 dB per decade) (All first-order filters, regardless of name, have the same normalized frequency response). For a second-order Butterworth filter, the response decreases at -12 dB per octave, a third-order at -18 dB, and so on. Butterworth filters have a monotonically changing magnitude function with ?. The Butterworth is the only filter that maintains this same shape for higher orders (but with a steeper decline in the stopband) whereas other varieties of filters (Bessel, Chebyshev, elliptic) have different shapes at higher orders. Compared with a Chebyshev Type I/Type II filter or an elliptic filter, the Butterworth filter has a slower roll-off, and thus will require a higher order to implement a particular stopband specification. However, Butterworth filter will have a more linear phase response in the passband than the Chebyshev Type I/Type II and elliptic filters. Chebyshev filters are analog or digital filters having a steeper roll-off and more passband ripple than Butterworth filters. Chebyshev filters have the property that they minimize the error between the idealized filter characteristic and the actual over the range of the filter, but with ripples in the passband. This type of filter is named in honor of Pafnuty Chebyshev because their mathematical characteristics are derived from Chebyshev polynomials. Because of the passband ripple inherent in Chebyshev filters, filters which have a smoother response in the passband but a more irregular response in the stopband are preferred for some applications. For more information on Filtering and Filter Lag, click here.